Oman is a truly amazing place. In terms of avifauna it lies at the crossroads between Asian and African species – Arabian desert species to the north, and a host of Afrotropical species occurring in the monsoon-swept south that don’t occur anywhere else in the Western Palaearctic. With much of the Middle East now effectively off-limits to birders, people are increasingly turning to Oman and its avian riches. 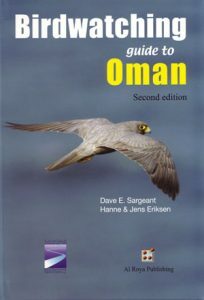 And what riches they are – highlights include the incredible Omani Owl, discovered just a couple of years ago in the Al Hajar mountains, a suite of regionally scarce wheatears, exotic pigeons, shearwaters and storm-petrels that can be seen from the beach, a host of wintering eagles plus impressive residents such as Verreaux’s, the only accessible sites for Arabian Golden-winged Grosbeak and Yemen Serin … the list goes on and on. 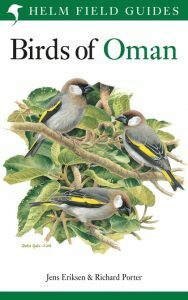 This book is the perfect guide to this wonderful country’s birdlife. 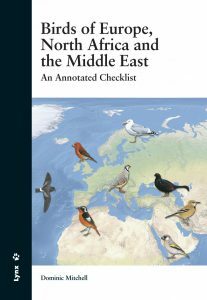 Written by the world’s leading expert on Middle Eastern birds, Richard Porter, along with Oman bird specialist Jen Eriksen, with colour plates opposite concise species text and accurate maps, it is indispensible for any naturalist visiting this jewel of the Arabian peninsula. Artist/Author: Grimmett, Richard, Tom Roberts and Tim Inskipp. This guide is a successor to the much acclaimed Birds of the Indian subcontinent by two of the same authors. 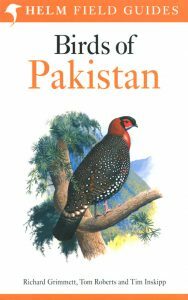 Covering Pakistan, the superb plates are accompanied by a succinct text highlighting identification, voice, habitat, altitudinal range, distribution and status. The text is on facing pages to the plates, for easy reference and there are distribution maps for every species. Like previous guides covering Nepal, Bhutan, Northern India and Southern India, this guide is a perfect size for use in the field and will be an essential companion when visiting this region. Artist/Author: Porter, Richard and Simon Aspinall. 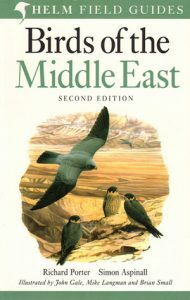 This is a completely revised second edition of the bestselling field guide to the birds of the Middle East. For the first time, the text and maps appear opposite the plates, and as a consequence there are fewer species per plate than before. The text and maps have been fully revised and many new artworks have been painted. There are more than 100 new species in this new edition, which features more than 810 species in total. Artist/Author: Sargeant, Dave E. et al. The site guide section of this excellent new birdwatching guide covers over 60 of the Sultanate’s top birdwatching sites – each including a detailed map, information on habitats, access and a complete list of the species with relative abundance. A birdfinder is included with details of how, where and when to best find each species, as well as a complete checklist with seasonal status.